Replacement: None at this time. 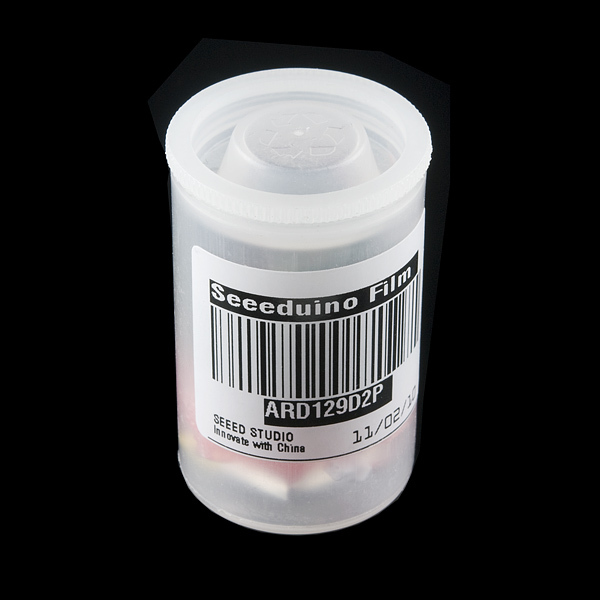 We are no longer carrying the Seeeduino FILM in our catalog. This page is for reference only. The Seeeduino FILM is an Arduino compatible development platform for space-sensitive projects. 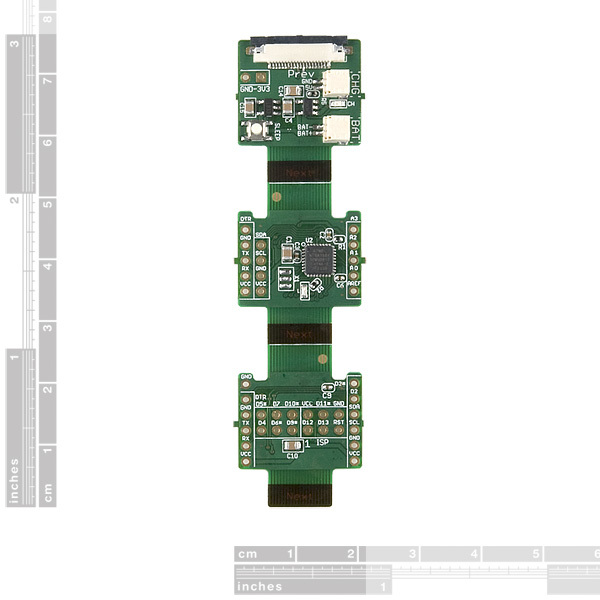 It’s flexible, super slim, has a built-in Li-Po charger, and is designed for wearable applications. FILM and other extension FRAMEs can be simply connected via the 20 pin universal bus like a chain. 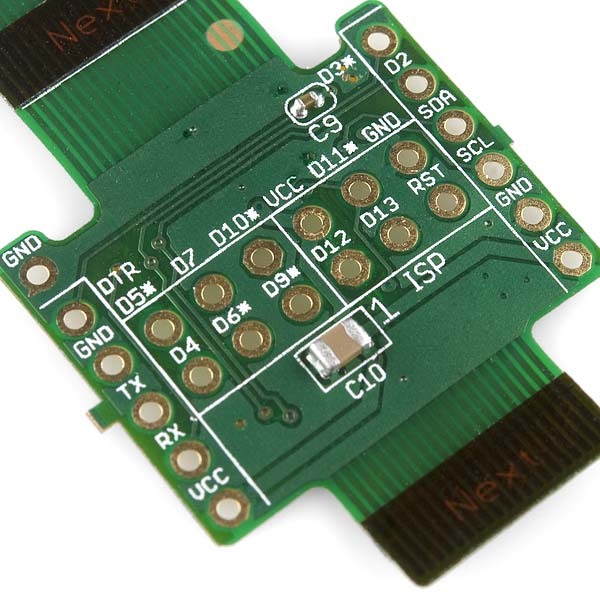 Native 2.54mm pitch pins also enables quick prototyping. At the heart of the FILM is an ATMega168 with an Arduino Bootloader. You can use the Arduino IDE, along with an FTDI (or other USB to serial adapter) to program the FILM just like a full-sized Arduino. Maybe you should sell Desk Pets, particularly the ones with an included controller-charger (such as SkitterBot and TrekBot). I think I have confirmed that they are the correct polarity for the Seeeduino Film (I'm not fully sure of which way the connector goes). 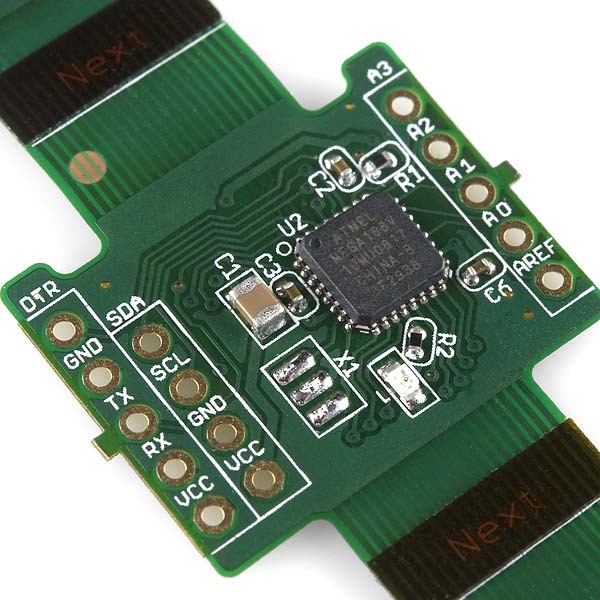 This is $19.00 on the Seeeduino website..? I've had an issue where I've exceeded the flex limit on the charging/power frame section, which seems to disconnect the battery from the power supply. Pressing on C14 lightly will bring the connection back while I'm pressing on it, but going anywhere near the sleep switch is almost guaranteed to break it again. Has anyone seen this issue? Is there a trace I can 'blue wire' to fix it? I'll try the Seeed forums too, but there are a lot of awesome people on SF too. is it possible to order extra batteries for the Seeeduino? And how long does it take to charge one battery? The battery connector seems to be JST-like but smaller. What's the battery terminal connector type called so that I can get a replacement and plug in a larger capacity battery? This is great! 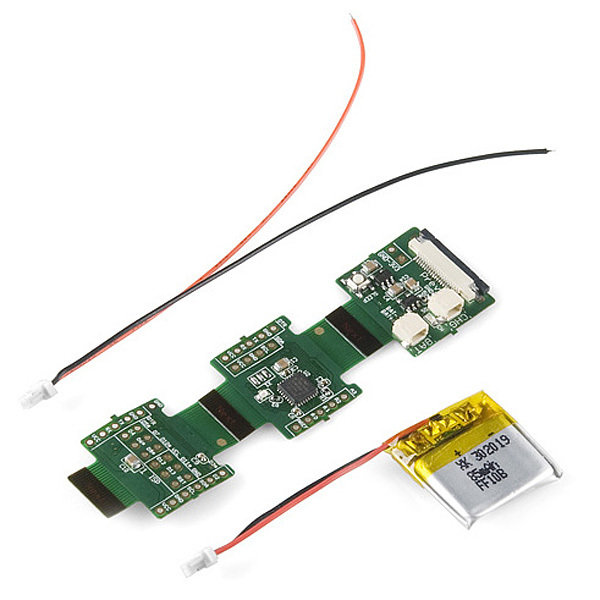 Is it possible to hook up with the xbee? If so, how? I just got mine, popped a mini-USB plug on it for power and threw some right angle headers on the programming FRAME and BAM uploaded a sketch, first-shot, no problems (Use Duemilanove w/168 Setting). It works like a freaking charm. A word of advice, though, the programming port pin-out (obviously) doesn't match the FTDI Breakout, I just used a couple of jumpers to get the right pins connected, they're all nicely labeled on the FILM. I can't say enough about how small this thing is... I'm using it for a wearable application, but I can imagine that even in a more weight sensitive application (like tiny quad-rotors?) the weight is nearly negligible, even with the Li-Po Battery. So... the logic level for this board is 3.3vdc but the datasheet says 5v Compatible. What does that mean exactly? 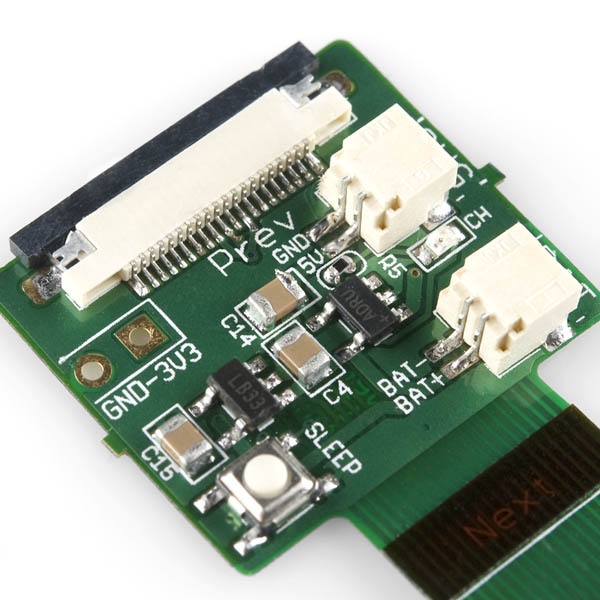 I have a 5vdc FTDI board, can I program with this or will I cook it? Wait... don't shout 'idiot' yet, I understand now, lol. It's not so much that I thought It would work as I "hoped" it would work... but I just remembered I can switch the solder jumper on my 5vdc FTDI breakout and go 3.3 anyway. Oh these are too freaking cool... FreeDay purchase. I bought it because it fits inside the film container. It's quite amazing. Nah, totally worth a post, it's really incredible how tiny this thing is. I'm holding it right now and I'm stunned, lol. And it's flexible too. You could tape it to a can. Is power transfered through the ribbon connector, or does each board need its own cable going to it? It took me forever to find this with the search bar. I only found it because I misspelled seeduino, and found out it actually is spelled seeeduino. This might just be the best controller idea I've ever seen. I'd like to see the same thing with a built in motor driver. Very cool! What is the weight? "Our scales don't go that low." This might be the situation here. Can we connect 2 of it with that next/prev ports ? how does it works ? Yes, you can connect multiples. Check out the last page on the datasheet for pin assignments.